I know that during Lent and the Easter season that the main thing that I want our children to learn and understand is that God loves us so much that he sent his one and only son Jesus to live in this sinful world and that he then died on the cross for each and every one of us! In order to understand this, we choose to share the Passion of Jesus with our children (even at a young age) and answer honestly what questions they have. 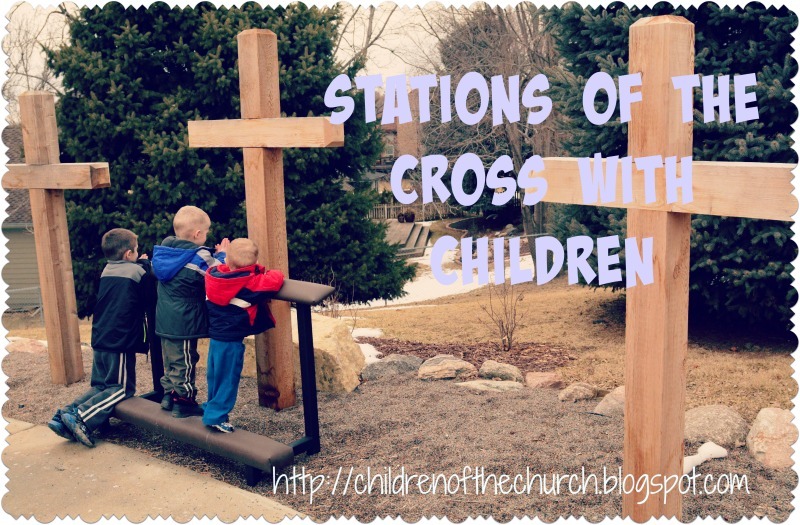 How can you learn about and pray the Stations of the Cross with your family even if you cannot go to the scheduled time at church? How can you make time and space for your family for this special meditation during Lent? I titled this post “learning typology,” instead of “teaching typology,” because this is a subject we can adapt to any age group. Many adult Catholics are unfamiliar with typology. So if your children are grown, or you’re not a parent, read this for yourself. If you do have young children or you teach religious education, you can adapt this to your students’ ages. If you are completely unfamiliar with typology or need a refresher course, start with my post on Teaching typology with Joseph and his brothers. Since it is Easter, it’s a good time to look at the similarities between the prophet Daniel and Christ. The story of Daniel in the Lions’ Den prefigures Christ’s Death and Resurrection. I will go through a proposed lesson step by step for various age and skill levels. 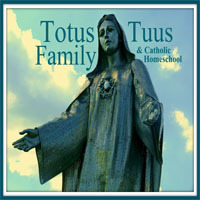 Contineu reading at Contemplative Homeschool. 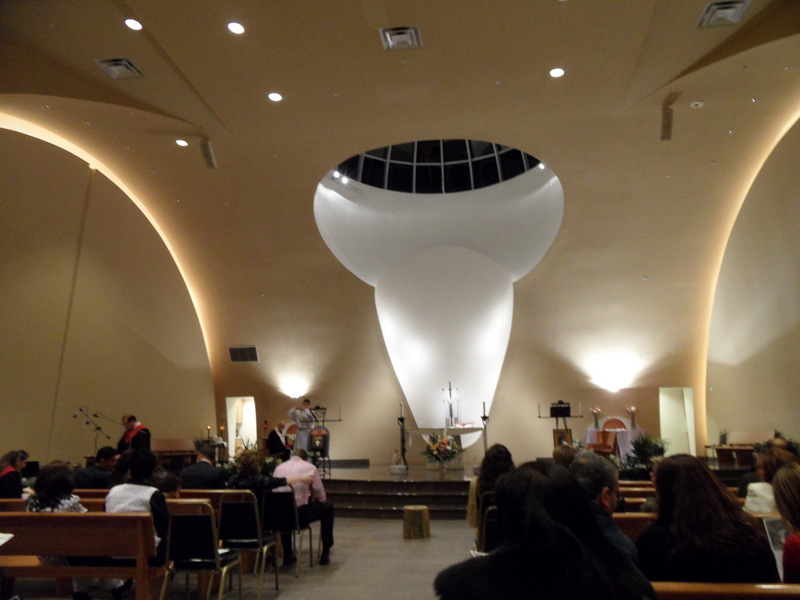 At Our Lady of Lebanon Maronite Catholic Church in Shepherd’s Park (Washington, DC) the Easter Vigil begins at midnight. The interior of the church reflects the austere monastic sensibilities of St. Maroun, the 5th Century Syriac monk who shaped this Syriac-Antiochian rite Catholic Church that profoundly influenced Lebanon. Prior to the accent lights being turned on, the design was stark and aesthetically challenging for me. Even with the lights on, the altar is surprisingly barren for the most important feast of the liturgical year for Christians. There were a few lillies at the foot of the main altar and there was a floral display on the East Apse which also served as the Empty Tomb for the Easter Vigil. Note the tree stump at the foot of the altar, that is used as a stand for the veneration of the Cross. Perhaps it harkens back to the Cedars of Lebanon, which is an important symbol amongst Maronite Catholics. This is the Clergy approaching the altar for the beginning of the Qurbono (Divine Liturgy). 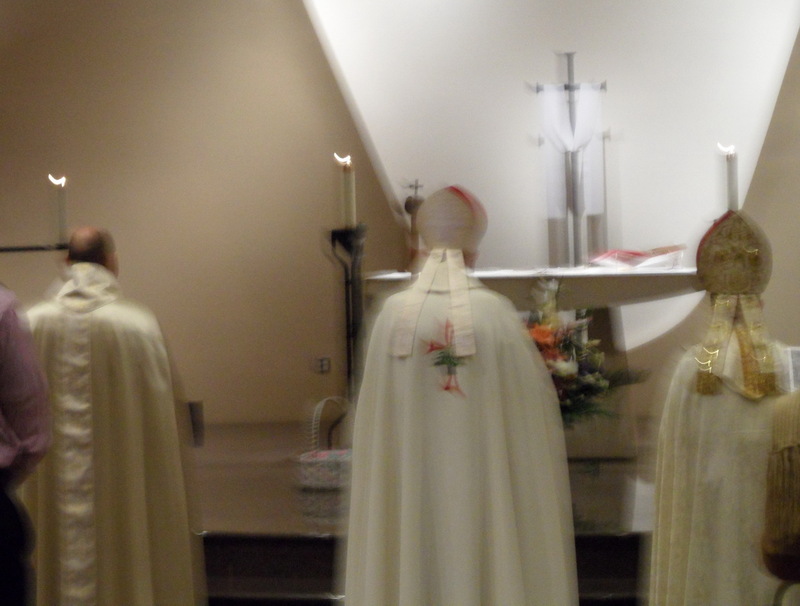 Note the Chorbishop in the center who’s vestment has a cross with the Cedar of Lebanon. The Liturgy was conducted in Syriac as well as English. The hymns that were sung were in Aramaic which was impossible for me to read. Aramaic was Jesus’ native tongue so it sounded like what the followers of “The Way” would have sung in the 1st Century A.D. There were some unusual aspects of this Easter Vigil. There was incense but no use of Holy Water or candles. The Maronite Church tends to baptize their Catachumens on the Feast of the Epiphany in January. Candles are not as import of an symbol at the Easter Vigil, as the Maronite Church breaks fast on noon of Great Saturday during the simple “Awaited Light” ceremony. This may explain why there is not pent up anticipation for the Easter Vigil as observed amongst the Maronites. It was remarkable how much this Liturgy celebrating the Resurrection emphasized the Glorious Cross. The Chorbishop made prayers on the four corners of the altar with the processional cross, as if to proclaim the hope of the resurrection to all the Earth. The faithful were invited to venerate the Glorified Cross as they received Communion. Another interesting Easter feature of this vigil Qurbono was the emphasis on the Empty Tomb. As the faithful departed from the Divine Liturgy, they were given flowers from the Empty Tomb as well as an Easter Egg. Despite the alternating languages during the Liturgy, it was not challenging to follow. The order of the Liturgy is different, as the Prayers of the Faithful are offered in the middle of the Liturgy of the Eucharist. In addition, the sign of peace is passed along from the altar to the congregation by youthful altar servers. 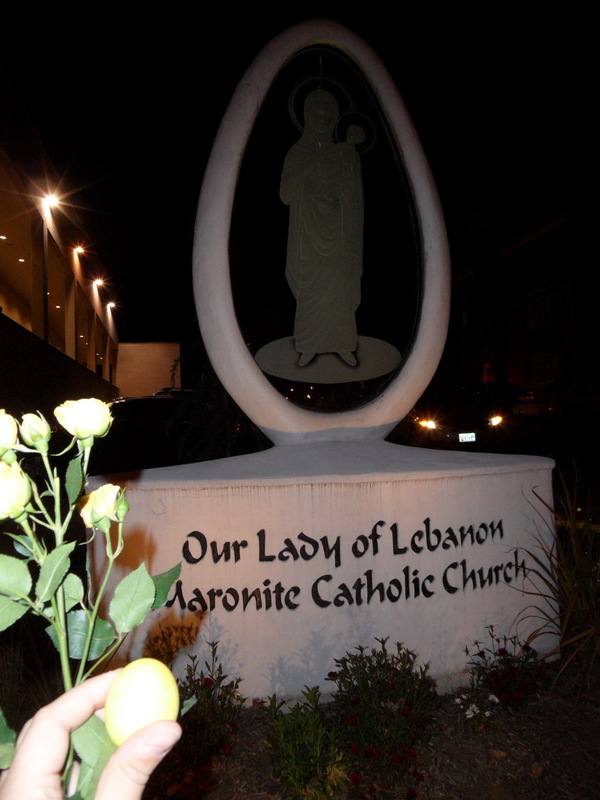 For me, the Maronite Qurbono was the most exotic of my Holy Week experiences. 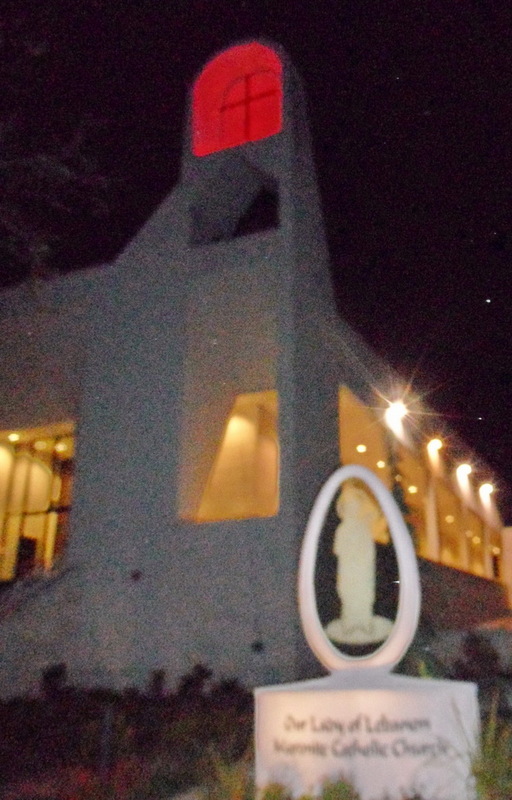 Unfortunately, I found the Easter Vigil at Our Lady of Lebanon to be anti-climatic and personally unsatisfying. That being said, I was intrigued by proclaiming the glory of the cross to the four corners of the Earth. In addition, I was touched by the post resurrection highlighting of the Empty Tomb as well as receiving the Easter souvenirs. Not much for eating Peeps. Peeps make me laugh. For me, they are a humorous part of my college graduation memories…. But for Easter decorating, well these Peeps take the cake! 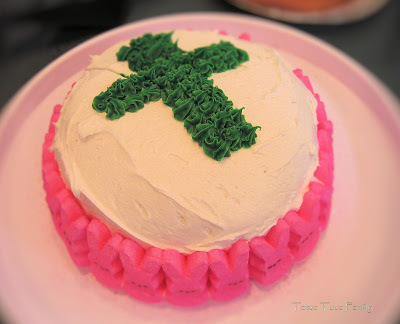 This is an Easter cake I made a few years back. It all has me imagining Peeps on swags like garlands and Peeps on sticks in flower bouquets and a college door…old, hardened Peeps on it and a night of revelry with my sistas! Yeah, Peeps make me laugh….